Since Smarty Pants has a discerning palate (who am I kidding? he's the world's pickiest eater! ), when I come across something healthy that he'll willingly eat, it's like winning the lottery. 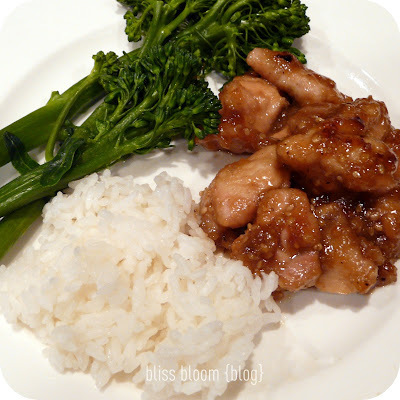 If you or someone in your family enjoys Orange Chicken, give this recipe a try! It's much healthier than what the Chinese restaurants serve up, and you can control the sweetness by playing with the honey/teriyaki ratio. In a large resealable plastic bag, combine flour, 1/4 cup sesame seeds, black pepper, five-spice powder, and red pepper flakes (optional). Place chicken pieces in the bag and shake to coat. Heat oil in wok over medium-high heat. Place chopped onion and chicken into skillet and brown on both sides. In a separate bowl combine teriyaki sauce and honey. Add teriyaki sauce & honey mixture to wok and stir in remaining 1/4 cup sesame seeds. Stir until sauce thickens. Heat through and serve.